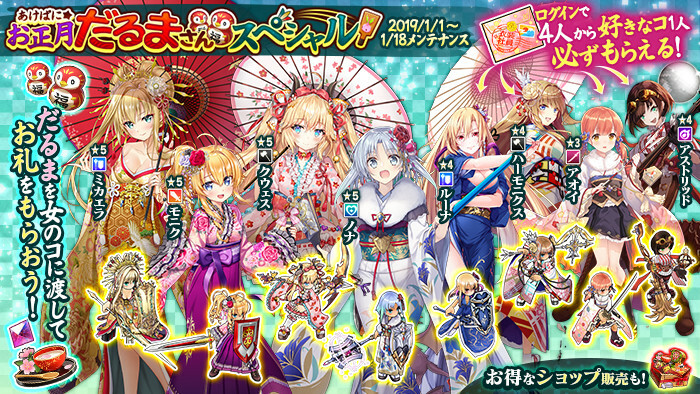 ▼ 8 New Year's Costume Employees appear! 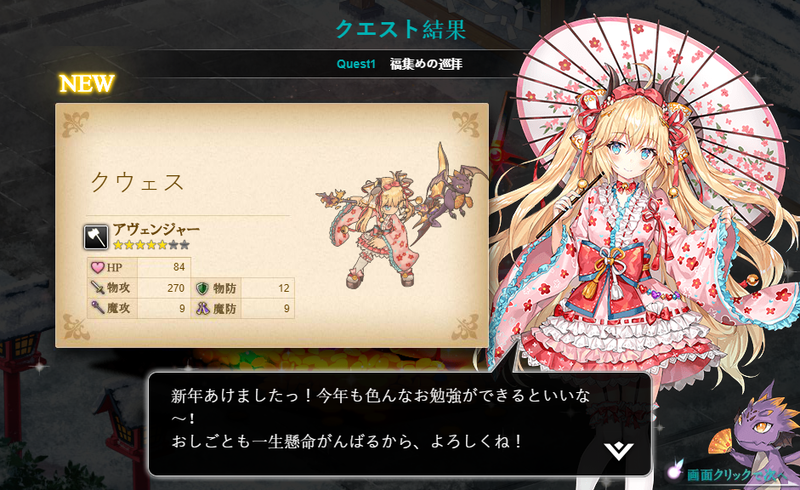 Starting at 1/1 (Tue) at 0:00, new costume employees wearing kimono will appear. ※ The above 8 employees will only appear during the [Akepani☆New Year's Daruma-san Special] event and will have resume appearance rates higher than normal employees. Furthermore, using the [Limited] New Year's Postbox will increase these chances. ※ The above 8 employees can be recruited from the rewards received from the [Merrypani☆Starry Night Christmas Party]. 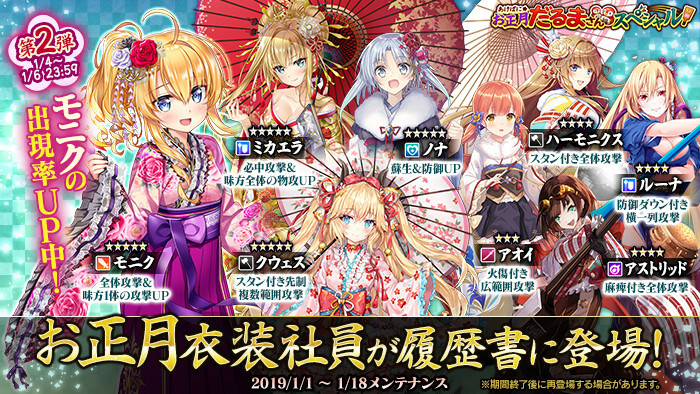 ▼ Log in to receive a ★3 or ★4 New Year's Costume Employee! Log in to receive a [Limited] ★3★4 New Year's Envelope (x4) where you can choose one of the costume employees [Aoi], [Astrid], [Harmonics], or [Luna] for free! ▼ Collect the Darumas to help the girls! During this event, help the eight girls by collecting the Darumas that have swarmed the city centre. 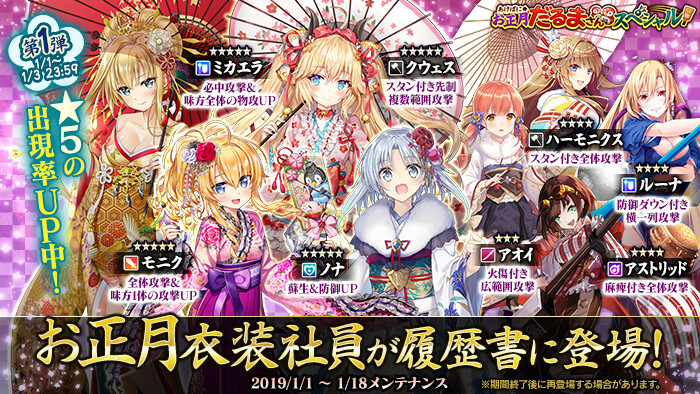 The Event Quests will drop [Limited] Daruma which can be collected to help these girls. Visit the special event page to deliver these [Limited] Daruma to the girls. 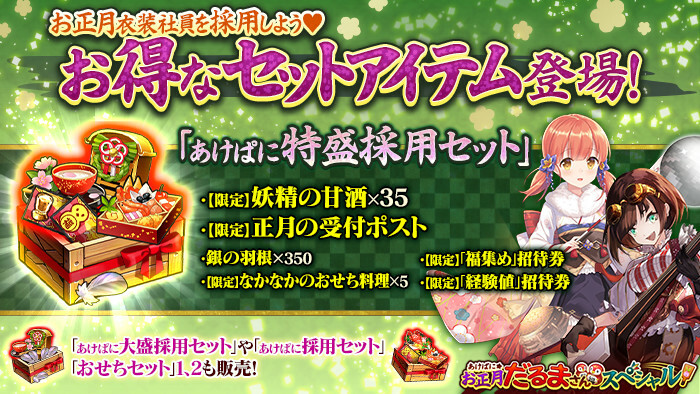 After receiving a certain amount of [Limited] Daruma, you will receive an item gift from the girl in return. Unlocking and reading through each girl's scenario will increase the Darumas and EXP you gain from the event quests! After helping Monique and finishing her scenario, the epilogue scenario will unlock. An Event Quest where you can collect [Limited] Darumas, EXP, etc. Use the [Urgent] [Fortune Collecting] Invitation Ticket to unlock the quest for 30 minutes. Drops a large amount of [Limited] Darumas. [Limited] Excellent Osechi can also appear as a rare drop. [Limited] Candy Stick can also appear as a rare drop. ▼ Collect Darumas more easily with New Year's Costume Employee Exclusive Weapons and Event Accessories! Equipping the following items in the event quest will lead you to a route where you can collect more Darumas. During this event, [Urgent Quests] which are only available during set times will appear. These Urgent Quests can help you collect large amounts of [Limited] Darumas or large amounts of EXP. 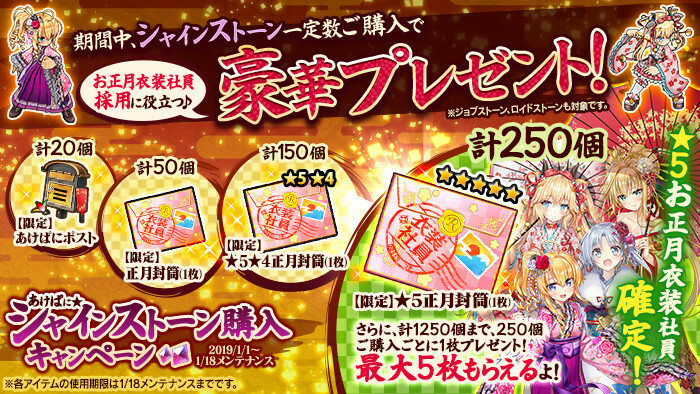 [Limited] New Year's Envelope (1x)? Unlocks the [Daruma] Quest for 30 minutes when used, where you can collect large amounts of Daruma. Expires 24 hours after the distribution time. Please check the distribution times for more details. 5 out of 0 members found this post helpful. Last edited by Folseus; 01-05-2019 at 03:17 AM. The event will end on 18. To fellow Sachos, please don't forget to use up all limited items, be it envelop or candy exp item.